There are 72 Assisted Living Facilities in the Santa Rosa area, with 46 in Santa Rosa and 26 nearby. The average cost of assisted living in Santa Rosa is $4,094 per month. This is higher than the national median of $3,346. Cheaper nearby regions include Kenwood with an average starting cost of $3,500. To help you with your search, browse the 187 reviews below for assisted living facilities in Santa Rosa. On average, consumers rate assisted living in Santa Rosa 4.2 out of 5 stars. Better rated regions include Sebastopol with an average rating of 4.6 out of 5 stars. Caring.com has helped 6 families in Santa Rosa find high-quality senior care. To speak with one of our Family Advisors about assisted living options and costs in Santa Rosa, call (855) 863-8283. Located in wine country, picturesque Santa Rosa is the county seat of Sonoma County. In Santa Rosa, seniors have plenty of assisted living communities to choose from. This small city is home to 44 assisted living residences, with 19 more located in nearby communities. All assisted living facilities are regulated by the California Department of Social Services, Community Care Licensing Division and are called Residential Care Facilities for the Elderly (RCFEs). Located 40 miles north of San Francisco, Santa Rosa has highly desirable weather. On average, there are 256 sunny days in Santa Rosa, much higher than the U.S. average of 205 days. It has a comfortable year-round climate and the area receives no snow in the winter. Santa Rosa has an air quality rating of 59, which is right around the U.S. average of 58. While not as polluted as some other areas of California, including Los Angeles, which recently ranked as the #1 polluted city by ozone, according to the American Lung Association, it still may be difficult for those with respiratory conditions to live in this area without using air quality management techniques. Santa Rosa's cost of living is substantially more expensive than other parts of the country. According to BestPlaces cost of living scale, where the US average is 100, Santa Rosa's score is 162.7, based on a number of factors, including housing, utilities, food and transportation. Santa Rosa offers a number of public transportation options, including the Santa Rosa CityBus and the Sonoma County Transit, which serves the greater county area. For longer trips and ferry access, the Golden Gate Transit offers a number of accessible lines. The Santa Rosa area is home to world-class medical facilities, including Sutter Santa Rosa Regional Hospital, St. Joseph Health-Sonoma County, Aurora Santa Rosa Hospital and Santa Rosa Memorial Hospital, in the event of medical emergencies or illness. Sonoma County is a member of the AARP Network of Age-Friendly Communities, meaning that its elected leadership “has made the commitment to actively work toward making their town, city or county a great place for people of all ages,” according to AARP. Assisted Living costs in Santa Rosa start around $4,094 per month on average, while the nationwide average cost of assisted living is $4,000 per month, according to the latest figures from Genworth’s Cost of Care Survey. It’s important to note that assisted living rates in Santa Rosa and the surrounding suburbs can vary widely based on factors such as location, the level of care needed, apartment size and the types of amenities offered at each community. 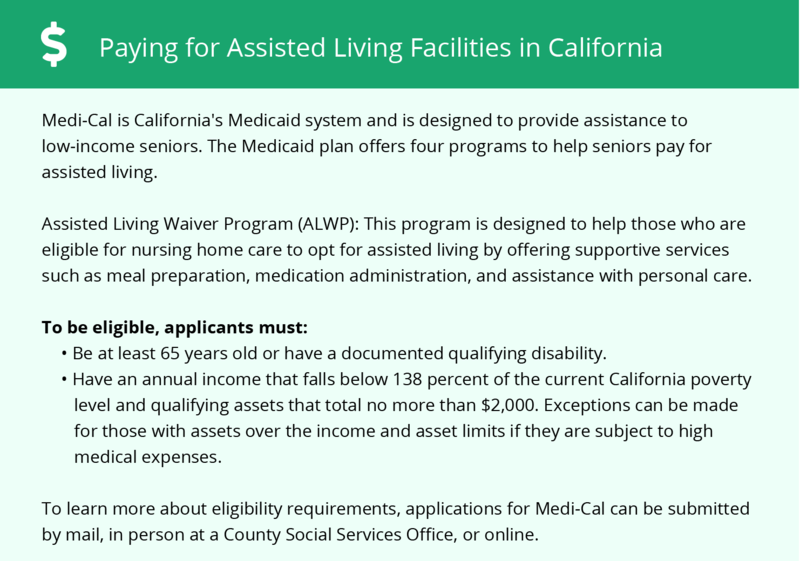 The state's Medicaid program, called Med-Cal, pays for services in assisted living communities and other housing types for the elderly. 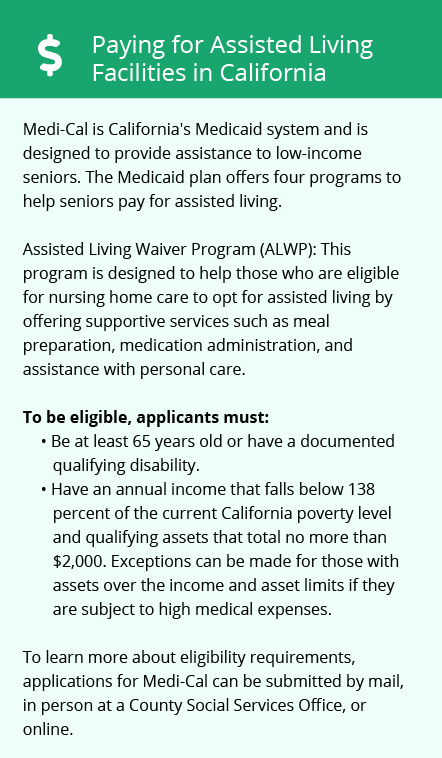 California's Assisted Living Waiver Program (ALWP) is offered in some parts of the state as well under the Med-Cal program. Santa Rosa and the surrounding area are home to numerous government agencies and non-profit organizations offering help for seniors searching for or currently residing in an assisted living community. These organizations can also provide assistance in a number of other eldercare services such as geriatric care management, elder law advice, estate planning, finding home care and health and wellness programs. To see a list of free assisted living resources in Santa Rosa, please visit our Assisted Living in California page. Santa Rosa-area assisted living communities must adhere to the comprehensive set of state laws and regulations that all assisted living communities in California are required to follow. Visit our Assisted Living in California page for more information about these laws.